Vancouver, British Columbia--(Newsfile Corp. - March 1, 2019) - Minaurum Gold Inc., (TSXV: MGG) (OTCQX: MMRGF) ("Minaurum") is pleased to announce that its on-going drill program in the Alamos Silver District in Sonora, Mexico (Fig. 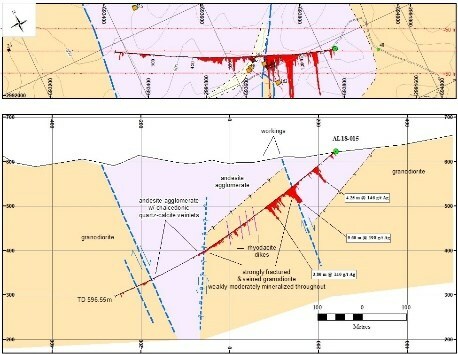 1) has demonstrated that three of the new vein systems mapped by Minaurum host significant mineralization at depth and have the potential for silver-rich shoots along strike and at depth. Furthermore, drilling has intersected five previously unknown blind veins. 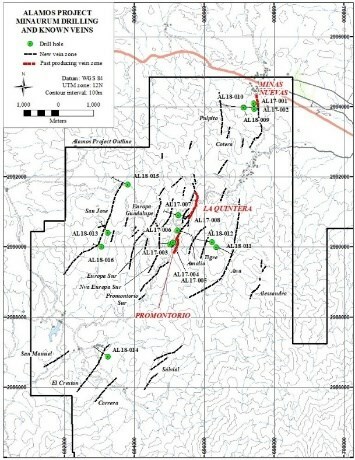 To date, Minaurum has drilled portions of 9 of the 15 vein systems identified at Alamos. The near-term exploration strategy remains focused on a first-pass test of new vein systems lying outside of the historically producing mines of Minas Nuevas, La Quintera, and Promontorio. Minaurum plans to put at least one hole into each of the veins identified. Upon completion of systematic project-wide testing, follow-up drilling (Phase III) will be prioritized based on drill and sampling results along with favourable geologic indicators. *Ag Equivalent is reported for comparison only, with no assumptions regarding metal recovery or smelter payments. Prices used are: Au: $1,321.90/troy ounce; Ag: $15.76/troy ounce; Cu: $2.81/pound; Pb: $0.94/pound; and Zn $1.21/pound (all amounts in U.S. dollars). "As we scope out the limits of this clearly large district, one new vein at a time, anything wider than 20 cm of >200 g/t Ag can be considered a success," stated Dr. Peter Megaw, Minaurum Director and Co-Founder. "We are delighted with what we're finding as we continue to focus on new vein systems throughout the district and look forward to determining how large this system ultimately is." "We're excited that drilling continues to cut significant silver and base-metal mineralization throughout the Alamos project. Our focus remains on aggressively stepping-out from the known areas and determining how many of our newly discovered veins have the potential to host mineralization similar to that produced historically from the Quintera-Promontorio vein system," stated Darrell Rader, President and CEO of Minaurum Gold. "As we know from the historic workings, high-grade deposits occur in shoots on veins that pinch and swell. By the second half of 2019, we will have drilled most of the new veins discovered thus far. At that point, we will allocate meterage for follow-up drilling on the veins where we've hit strong mineralization." This recently discovered vein was tested by three holes spread over more than 2 km along strike. In Hole AL18-015, a 4.25-m interval from 57.75 to 62.00 m averaged 146 g/t Ag, 0.16% Cu, 0.52% Pb, and 0.56% Zn. This includes a 0.9-m section assaying 302 g/t Ag, 0.21% Cu, 0.49% Pb, and 0.78% Zn. A second 9.6-m interval in the same hole from 127.60 to 137.20 m averaged 198 g/t Ag, 0.17% Cu, 0.22% Pb, and 0.88% Zn; including a 0.85-m interval of 398 g/t Ag, 0.24% Cu, 0.27% Pb, and 1.73% Zn. A deeper interval measuring 3.80 m from 192.90 to 196.70 m, averaged 140 g/t Ag, 0.10% Cu, 0.99% Pb, and 1.12% Zn including 2.05 m running 181 g/t Ag, 0.14% Cu, 1.64% Pb, and 1.57% Zn. The four intervals appear to show that the San José zone splits into multiple mineralized strands in the vicinity of hole AL18-015. In AL18-013, a 1.30-m interval from 295.35 to 296.65 m ran 16 g/t Ag, 0.08% Cu, 0.33% Pb, and 0.42% Zn. AL18-016 reported an 8.75-m zone averaging 32 g/t Ag from 71.00 to 72.50 m. Both intercepts are in hydrothermal breccias, which confirms the strength of the San José zone along strike. 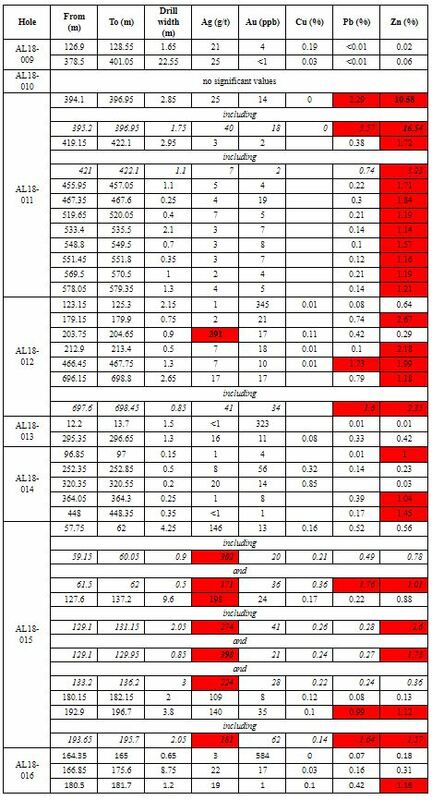 Hole AL18-011 cut significant limestone/skarn-hosted zinc-lead mineralization in a blind vein in the hanging wall of the Ana zone over 2.85 m averaging 2.29% Pb and 10.58% Zn from 394.10 to 396.95 m. Nine other intervals cut over 1% Zn over widths of up to 2.95m. These base metal-rich zones appear to represent deeper levels of the epithermal system. AL18-012 targeted the Tigre and Amalia vein zones, cutting first a blind vein from 123.15 to 124.20 m that averaged 666 ppb Au and 0.59% Zn before hitting a 0.90-m zone from 203.75 m to 204.65 m returning 390 g/t Ag, 0.42% Pb, and 0.29% Zn. 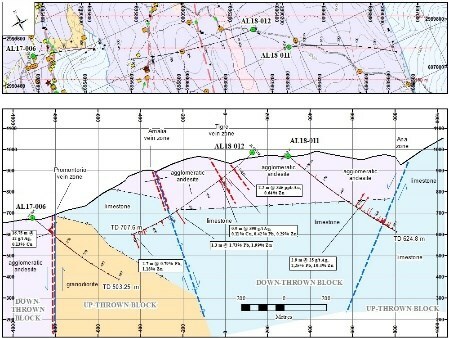 AL18-012 also intersected a 1.30-m limestone/skarn-hosted interval, possibly the Amalia zone, from 466.45 m to 467.75 m that returned 1.73% Pb and 1.99% Zn. AL18-014 tested the intrusive-hosted El Crestón vein zone in the southwestern part of the project area, on the recently acquired Yoreme concession. The hole encountered a >100-m wide zone of stockwork/sheeted quartz veining with anomalous metal values. One 0.20-m interval assayed 20 g/t Ag and 0.85% Cu. Another 0.35-m interval ran 1.45% Zn. Holes AL18-009 and AL18-010 were collared in the Minas Nuevas area. AL18-009 targeted the Minas Nuevas vein zone, below the intersection of hole AL17-002 (see NR dated 3 Nov 2017) and cut 22.55 m averaging 25 g/t Ag. Hole AL18-010 drilled from the same pad as -009, in the opposite direction (due west), aimed at the projections of the Cotera and Púlpito vein zones. The hole did not reach either of these zones, suggesting they may dip more westerly than originally thought. Drilling will continue to test new veins identified in Minaurum's on-going surface mapping and sampling program. These include the Europa Sur, Nueva Europa Sur, Alessandra and Promontorio Sur zones. Table 1. 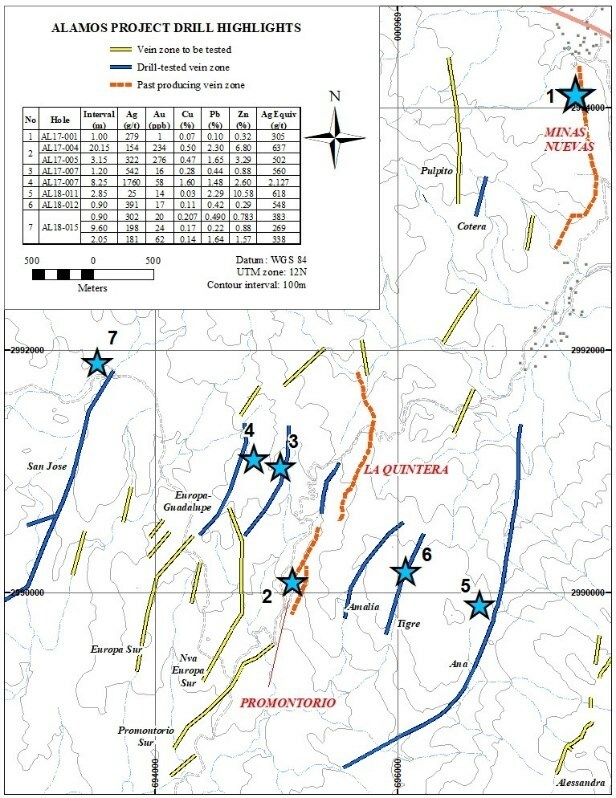 Highlights of mineralized intersections from 2018-2019 drilling campaign, Alamos project. Hole collar locations are shown in Figure 2. Minaurum Gold Inc. (TSXV: MGG) (OTCQX: MMRGF) (FSE: 78M) is a Mexico-focused explorer concentrating on the high-grade Alamos Silver project in southern Sonora State. With a property portfolio encompassing multiple additional district-scale projects, Minaurum is managed by one of the strongest technical and finance teams in Mexico. Minaurum's goal is to continue its founders' legacy of creating shareholder value by making district-scale mineral discoveries and executing accretive mining transactions. For more information, please visit our website at www.minaurum.com and our YouTube Minaurum Video Channel. Cautionary Note Regarding Forward Looking Statements: Certain disclosures in this release constitute forward-looking information. In making the forward-looking statements in this release, Minaurum has applied certain factors and assumptions that are based on Minaurum' s current beliefs as well as assumptions made by and information currently available to Minaurum. Although Minaurum considers these assumptions to be reasonable based on information currently available to it, they may prove to be incorrect, and the forward-looking statements in this release are subject to numerous risks, uncertainties and other factors that may cause future results to differ materially from those expressed or implied in such forward-looking statements. Readers are cautioned not to place undue reliance on forward-looking statements. Minaurum does not intend, and expressly disclaims any intention or obligation to, update or revise any forward-looking statements whether as a result of new information, future events or otherwise, except as required by law.Stephen R. Maynard, Vice President of Exploration of Minaurum and a Qualified Person as defined by National Instrument 43-101, reviewed and verified the assay data, and has approved the disclosure in this News Release.